What wedding flower trends are going to be big for the year ahead? 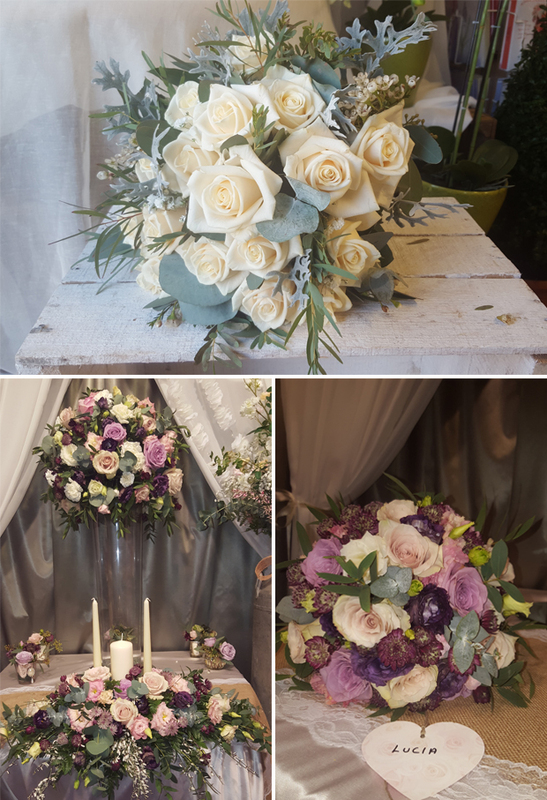 Our experts Jesse from Bloomsday Flowers, Caoimhe from Joy’s Flowers for You and Celine from Celine’s Flowers & Gifts share their top wedding flower trends for 2017! In recent years we have seen a big shift in what’s popular for wedding flowers. It seems now that couples are opting for a style that is more informal and free. With life being so busy, it’s a chance to bring the calm and soft features of nature inside. Pantone have released their 2017 colour of the year ‘Greenery’ and it seems very fitting with this recent trend that ‘Foliage’ is the new buzzword in the world of floristry. 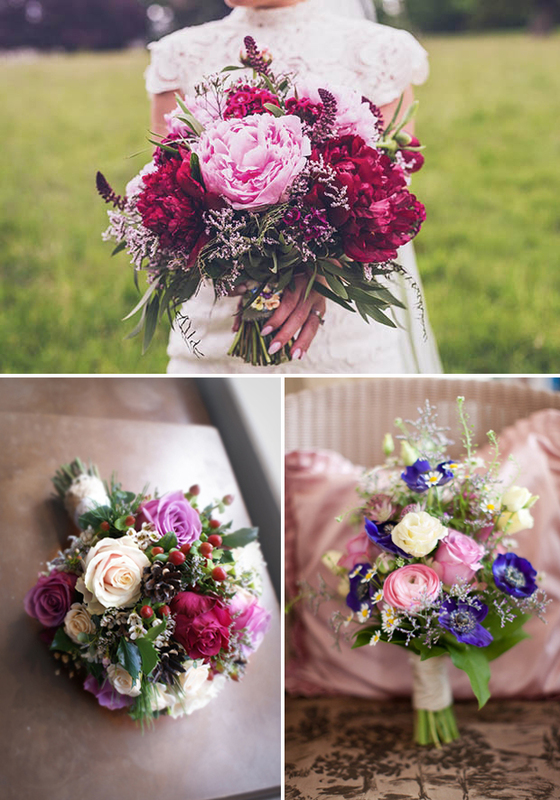 We can expect to see lots of branches, leaves, vines and garden herbs being used to fill bouquets and decorate venues. We particularly love working with an abundance of ferns, eucalyptus and the beautiful lambs ear. We expect to see a big rise in garlands, wreaths and hanging floral centrepieces. We’re noticing more couples opting for colours like berry, reds and blues. This boho style creates a real sense of warmth and something a bit different to the Rose Quartz colour that was very popular in 2016. There’s a great choice of flowers on offer from Dahlia’s to Ranunculus, Peony Rose and Astilbe, perfect for something that bit different. To add a bit of contrast, a soft blush or pastel colour would work a treat! Enjoy all your planning and remember to take a few minutes on your wedding day to step back and take it all in. Green is the colour of the year for 2017 and the big trend in wedding flowers we expect to continue this wedding season is FOLIAGE. Lots of greenery garlands and swags on wedding chairs and pews, foliage table runners, and loose, flowing, organic bridal bouquets. This trend is great for getting showstopper looks on a realistic budget, with lots of drama from floor skimming church flowers and cascading table décor. Spring/summer brides should look at fresh green leaves like ferns, lemon leaves, pittosporum, and pistacia, which give a fresh garden look complementing light, bright blooms. 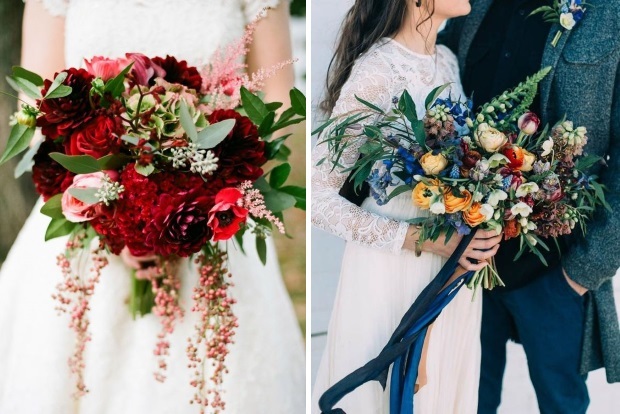 Autumn/winter brides can get great value and quality in eucalyptus, olive, as well as grasses, branches, and berries which complement subtle winter colour schemes and jewel toned blooms. 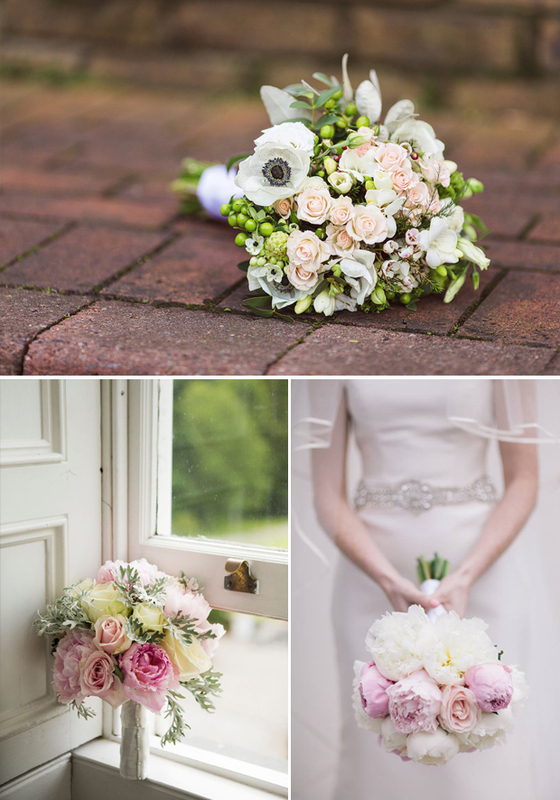 To make the most of the loose foliage wedding scheme, we will be recommending lots of big, showy statement flowers, including peonies and dahlias for summer weddings, and amaryllis and protea for autumn/winter. 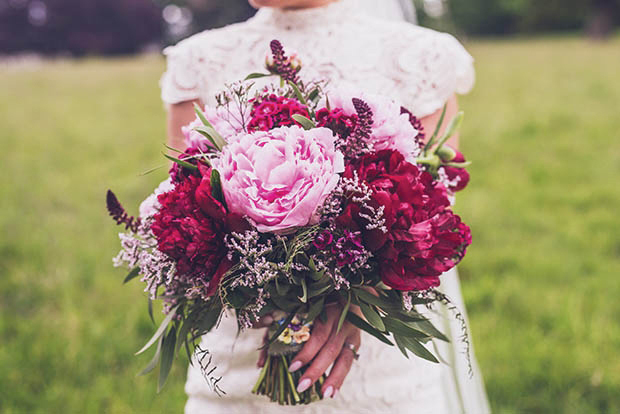 Along with large statement blooms, budget-friendly traditional flowers such as large chrysanthemums and carnations are making a comeback with variegated heirloom varieties to create that classic ‘fine art wedding’ look. Colour schemes to watch for 2017 are jewel tones and neutral pastels, lots of deep tones of plum and burgundy combined with blush pink, creams, and silvery greens. Ivory and cream are popular again, perfect with foliage heavy green floral themes. Metallics such as rose gold and copper are still really on trend, with lots of home décor touches being incorporated into wedding table looks. We are looking forward to designing a lot of great wedding flower schemes in 2017 and love collaborating with our enthusiastic couples to come up with the perfect floral themes for their big day! Flower Trends for 2017 – foliage and lots of it! Modern boho-chic brides are choosing unstructured loose foliage bouquets with a few large blooms incorporated and succulents for even more texture and colour with flowing ribbons to set the look off! A selection of muted sand colours, lilac tones, mulberry tones together with sages, olives and grey foliage will complement a variety of bridesmaids colours and photographers just love them. Garlands for 2017 will give you the wow for any reception, they can be used in so many different ways. Around picture frames, candelabras, the top table, banqueting tables, arches, door frames. Roses and peonies will always be up there with the top bridal flowers but for 2017 bridal bouquets will have a more natural, organic, unstructured look like you ran out to a meadow or garden and you gathered the flowers.